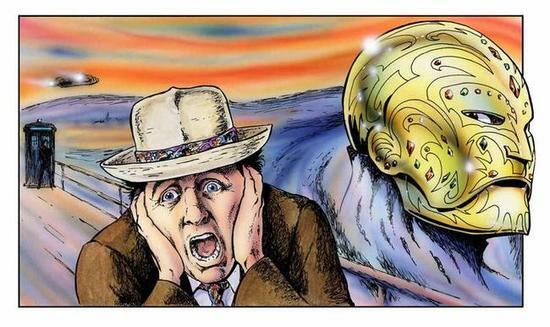 On nineteenth Century Earth artist Edvard Munch hears an infinite scream pass through nature. Centuries later his painting of that scream hangs in a gallery on the barren dust world Duchamp 331. Why is there a colony of artists on a planet that is little more than a glorified garage? What is the event that the passengers of the huge, opulent pleasure cruiser ‘Gallery’ are hoping to see? And what is hidden in the crates that litter the cargo hold? The Doctor’s diary indicates that the painting is about to be destroyed in ‘mysterious circumstances’, and when he and Ace arrive on Duchamp 331, those circumstances are well underway. Sylvester McCoy as the Doctor in Dust Breeding. Mike Tucker has written two scripts for Big Finish. One, The Genocide Machine, will be reviewed down the line, but it’s best described as a script full of missed opportunities and ideas that go nowhere. The second script, Dust Breeding, is packed with a lot of ideas, but they fail to be fully fleshed out before coming together for the climax. The script doesn’t collapse under its own weight because the myriad ideas end up failing to carry much weight. Let’s start with some of the high points. The villain of the piece, which goes by the out-of-place name of the Warp Core, is a superweapon that escaped its creators thousands of years ago, and travelled throughout the universe, looking for a suitable mind to inhabit and begin a campaign of destruction on its own terms. When it inhabits the mind of Edvard Munch and tries to communicate in its own language, that of a high-pitched keening scream, the artist manages to trap it inside a painting. The idea of a sentient being trapped inside of a painting is a unique one, and when the Warp Core manages to break free and affect the mind of several characters, including the Doctor, the use of voice modulation immediately infects the listener’s mind. A scene where the Warp Core possesses the Doctor and explains its history to Ace is very well done by both McCoy and the sound engineer. When the Warp Core finally breaks free and fully inhabits its final victim, its cries of triumph and success are incredibly well done. In fact, the use of sound is one of the strongest parts of Dust Breeding. From the howls of the storms ripping across Duchamp 331, to the powerful voice of the Warp Core and the sharp growls of its ancient enemy and resident of Duchamp 331, the Krill (from the Past Doctor’s Adventure novel Storm Harvest), to the footsteps going down grand halls in various art galleries, director Gary Russell deserves to be commended for his audio direction. Even with only three people, the initial scenes set about the luxury liner suggest a bustling, constant ball, with drinks being poured and patrons murmuring their approval of fine art. From the use of sound alone, it’s very easy for the listener to set the scenes in their imagination. The sound is so good, it’s very easy to wish it had a better script to go along with it. Tucker makes an attempt to weave a complex, intricate plot, but the script fails to properly develop most of the threads, and instead of an intricate pattern, it becomes a jumbled mess. The story jumps between three main areas; the refueling station, the luxury liner, and the art commune. Ian Ricketts plays Guthrie, a long-timer employee at the refueling station. His only purpose is to be there for the final act, and Ricketts seems to just lumber through the part in a manner so low-key it verges on a bored performance. Even his story about why he hates Duchamp 331 is told in a non-emotional, matter-of-fact manner, and a subplot about the dust of the planet turning a corpse into a zombie doesn’t even raise a reaction from him aside from “this planet has secrets.” Johnson Willis, as Damien, the head of the art commune, goes the other way and chews the hell out of the scenery. It’s a sharp contrast to Guthrie, and ties in well with the Warp Core, but the imbalance is striking enough to raise an eyebrow or two. As for the luxury liner, Caroline John’s accent as Madame Salvadori doesn’t reach [b]Minuet in Hell[/b] levels of annoyance as she plays it more silly than sinister. By the time she leaves the story in a moment of-self sacrifice, a listener’s ears are most thankful and as such, the moment is ruined. The final plot point is the return of Louise Faulkner as Bev, who was a part of the aforementioned The Genocide Machine. While I like to see a bit of continuity, she doesn’t do much to stand out and establish herself as important, even as she slides into the companion role for the duration of the serial. You could have replaced her with another character and very little would have changed. Sylvester McCoy and Sophie Aldred are fine in their parts. As mentioned earlier, McCoy does a great job of playing the possessed victim as one point, but beyond that, he sounds just a bit bored and non-invested in the story. It’s not enough to ruin it, but it’s enough to notice when compared to his turn in The Fires of Vulcan. For Aldred, her dialogue was written as very “Ace” like, which does have some good moments, but she comes off less tough and more insecure than she did in The Fearmonger, again in just enough of a way to be noticeable to the listener, which can be blamed more on the script than the actress. What seperates Dust Breeding from being an “adequate” serial, however, is the second episode cliffhanger. I don’t want to give anything away, but considering the serial came out in 2001, it was enough of a shock and a surprise to Big Finish fans to make it a “must hear” serial. Indeed, the ramifications of the cliffhanger play out for the rest of the serial, and even down the road into a few future productions. To say anymore is to give it away…but even long-time Whovians who might pick up on the twist before it happens will be surprised as just how well it’s pulled off. 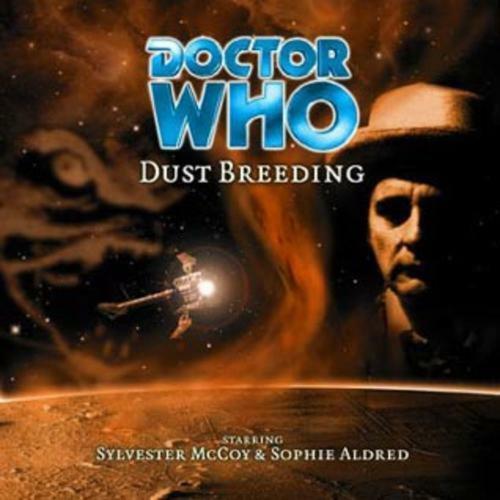 Final Synopsis – Better known for a cliffhanger than as an actual story, Dust Breeding suffers from a script too complex for its own good and ideas that might have better been fleshed out in a novel than an audio play. Still, it’s worth a listen if just for how the moment plays out. 3/5. Colin Baker is the Doctor in…Bloodtide. This entry was posted in Big Finish Review and tagged Ace, Big Finish, Doctor Who, Seventh Doctor, Sylvester McCoy, TARDIS, the Master. Bookmark the permalink.